On the 14th October 2016 whilst working as a roofer, James had a serious fall at work. He slipped and was left hanging on to cast iron guttering by his fingertips until it gave way and he fell over 30ft to the ground breaking his hip, pelvis and a bone in his lower back resulting in life changing injuries. The accident left him in hospital for 13 days but James drew strength from his children and their strength of character gave him the motivation to get on his feet again. 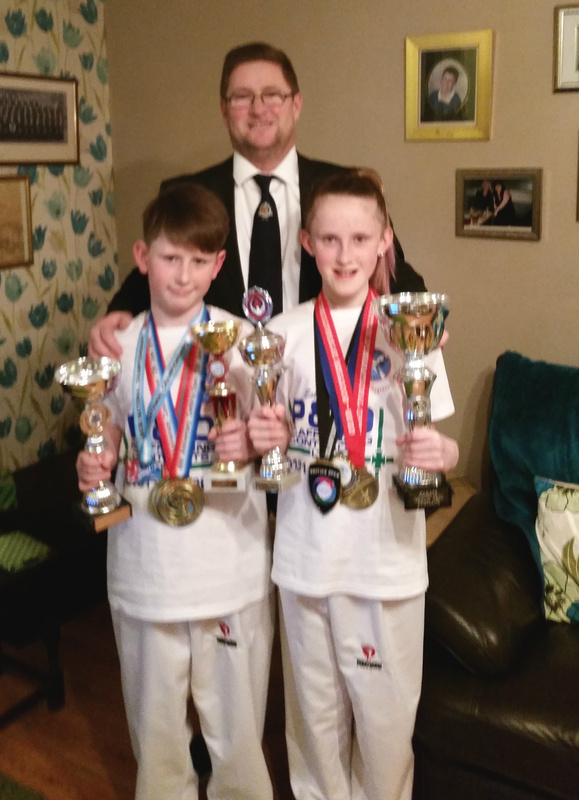 Only the week before, James was watching his children Caitlin, eleven and John Henry, nine, win silver medals in a European karate kumite individual finals. After James left hospital, there were still numerous setbacks and many long painful days. Supporting the family financially soon became a major issue. James daughter Caitlin was working towards her 1st Dan black belt and the extra expense of training and household bills were stacking up which was taking its toll on James. He was at his lowest point with mounting debts, no money coming in and feeling as if he had nowhere to turn to when he heard about our charity. James made contact with us and welfare visitor, Mark Everett visited James in his home. James describes Mark as a ‘real gent’ and says that the emotional lift he felt when Mark visited was immense. At last, James felt hope that someone out there was willing to listen to him and look at ways to help him through his darkest days. We were able to help James by providing him a lump sum payment and a monthly grant which has helped him and his children immensely by bringing a degree of normality back into their lives. As a result of the accident James has been diagnosed with post-traumatic stress disorder (PTSD) and is now participating in counselling sessions which he is confident will get him back to the person he used to be before the accident. Once James is back on his feet, he hopes to be able to give something back to the charity and do some voluntary work. We’re sure he would make a very valuable member to our volunteer network supporting people like himself and offering them hope and reassurance when every other door appears to be firmly shut. James added, “Caitlin achieved her 1st Dan and won the British Karate Federation International Open as did John Henry. Both have been put into the Elite Squad and have the opportunity to go to Umag in Croatia for WKF training camp and to train for the World Youth Cup. There’s a lot of hard work involved to be able to stay in CEK Elite Squad and fingers crossed they will be selected for the European championship later in the year. My children are my world and that’s what keeps me going through my darkest moments, their positivity and motivation to be the best that they can be is an inspiration to us all. On behalf of my children and from me I’d like to say a huge thank you to everyone at the Lighthouse Charity for being there for us when we had nowhere to turn and thank you for keeping my kids dreams alive”. If you’d like to know more about how you can support our work and help people like James, visit our Support Us page.